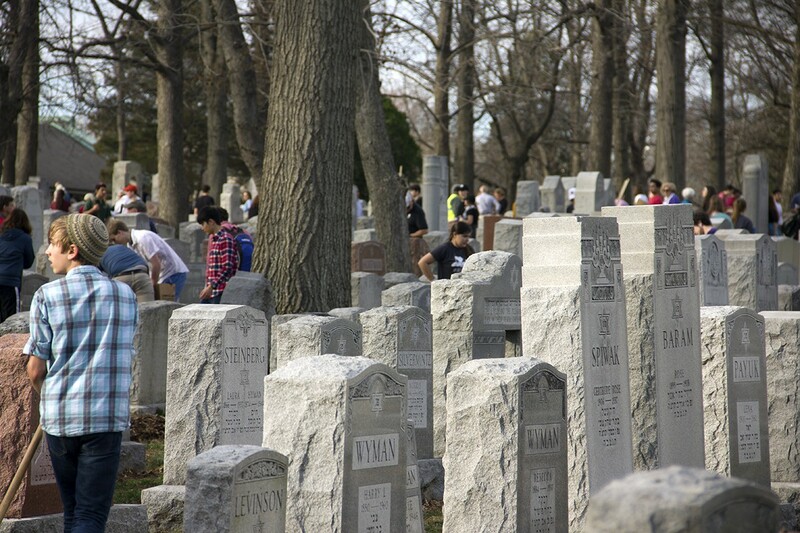 The Chesed Shel Emeth cemetery was packed with volunteers on Wednesday. Despite the crush of reporters and volunteers filling the Chesed Shel Emeth cemetery Wednesday afternoon, Marc Daniels managed to slide through a gap in the crowd — and suddenly, there he was, face-to-face with Mike Pence. Removing a red yarmulke from his head, Daniels pressed the fabric disk into the hands of the Vice President of the United States. "This is for you and the president," Daniels said. The yarmulke was stamped with the names of Donald Trump and Mike Pence, each in gold lettering. The two men talked for a moment, then hugged. "Thank you, you're a good man. God bless," said Pence, taking the yarmulke and rejoining the bustle of secret service agents and TV news crews. Daniels hung back, watching the procession roll toward the opposite end of the cemetery where, in a shocking act of desecration, more than 150 gravestones had been toppled over the weekend. Multiple police agencies are investigating the vandalism. 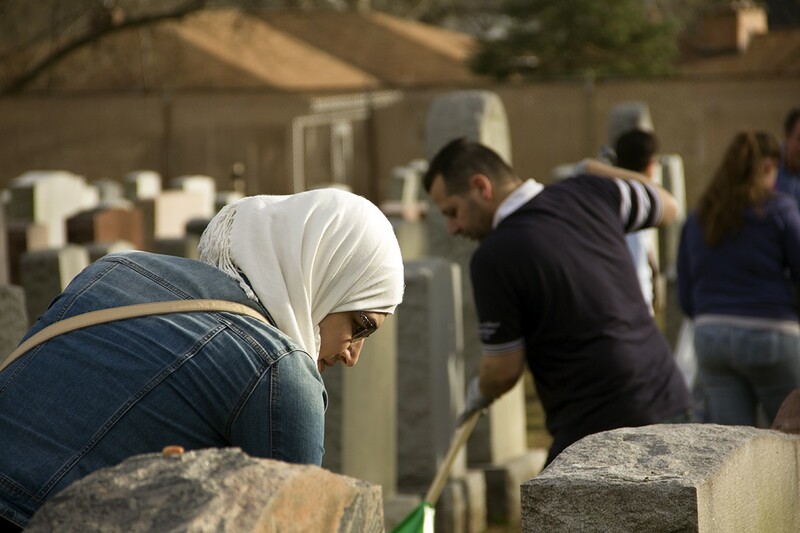 Resettled Syrian refugees Durra and Mohammad Asarwani also chipped-in with the cleanup yesterday. 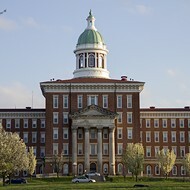 The scale of the desecration made international headlines and stunned St. Louis' Jewish community. 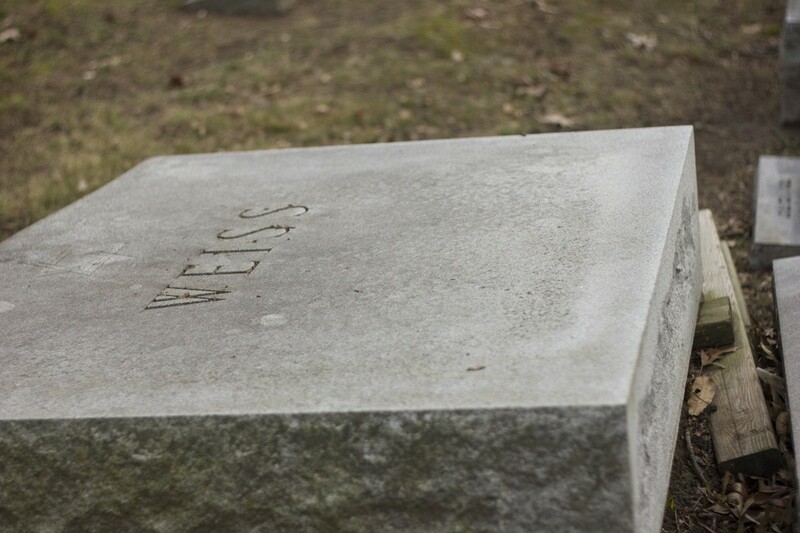 The cemetery is more than a century old, and some headstones had been smoothed by time long before the vandals struck. But the person or persons responsible for the vandalism left no mark to indicate motive. The senselessness of it, coupled with the effort it must have taken to damage so many headstones has left unanswered questions hanging above the venerated grounds. Who could do such a thing? Who would even want to? 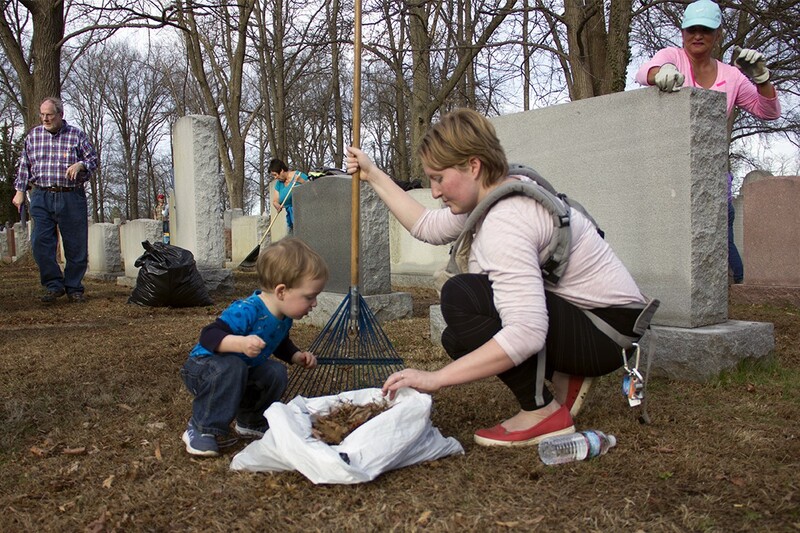 "It could be just some kids," said Lynnsie Balk Kantor, a real-estate agent who joined the hundreds of volunteers who showed up Wednesday to assist the cleanup efforts. Kantor counts sixteen relatives buried in Chesed Shel Emeth. When pressed, however, Kantor conceded that she personally doesn't detect the handiwork of teenage vandals. The wreckage is simply too specific, too extensive. "I feel like it was probably something that was done on purpose against Jewish graves," she said. "We can’t look at this without saying, 'What country are we in, what decade are we in?’ This is so frightening, beyond words." 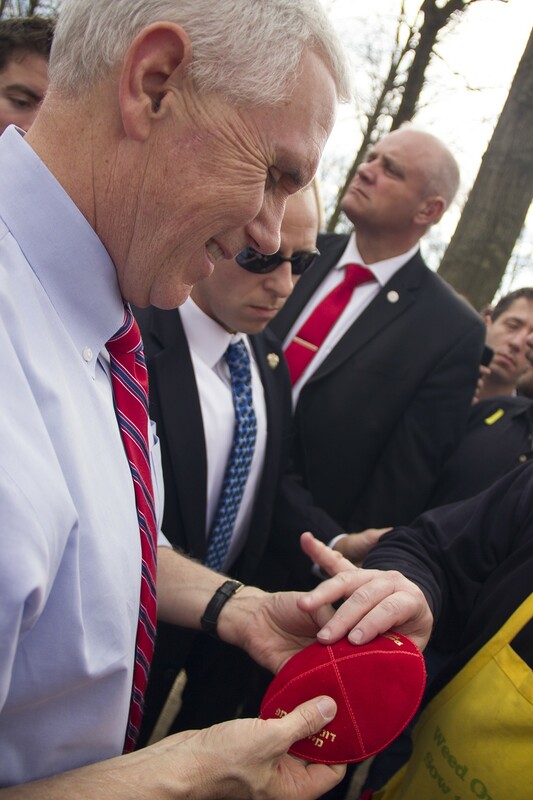 Vice President Mike Pence examines a yarmulke handed to him by Marc Daniels. Because it's not just about Chesed Shel Emeth. Over the last six weeks, 53 Jewish community centers in 26 states and one Canadian province have been targeted with 68 bomb threats, reports the Los Angeles Times. 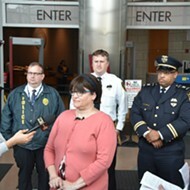 Last month, a bomb threat led to the evacuation of the Creve Coeur campus of the St. Louis Jewish Community Center. Granted, none of the threats have led to violence, but the resulting tension disrupted Jewish communal life nationwide and has deepened concerns about the possible link between incidents of anti-Semitism and Trump's election. Considering the recent chatter about Trump and anti-Semitism — particularly after the president berated an Orthodox Jewish reporter during a White House briefing — it was no surprise that Pence decided to join Governor Eric Greitens on Wednesday for a trip to the cemetery. Pence was already in town on a scheduled stop at a construction equipment shop in Fenton. "What happened here was a despicable act of vandalism," Pence said in a brief speech to the volunteer cleanup crew. "It was anti-Semitism and it was painful to so many families." 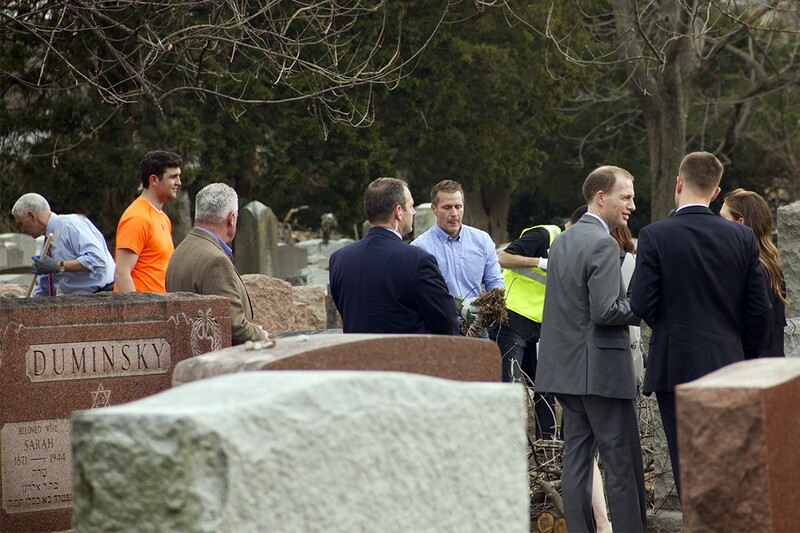 Later, Pence and Greitens donned work gloves and raked debris from around a section of the cemetery. 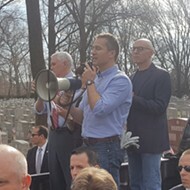 Missouri Governor Eric Greitens (center) and Vice President Mike Pence (left, holding a rake) cleaned debris from gavesites. 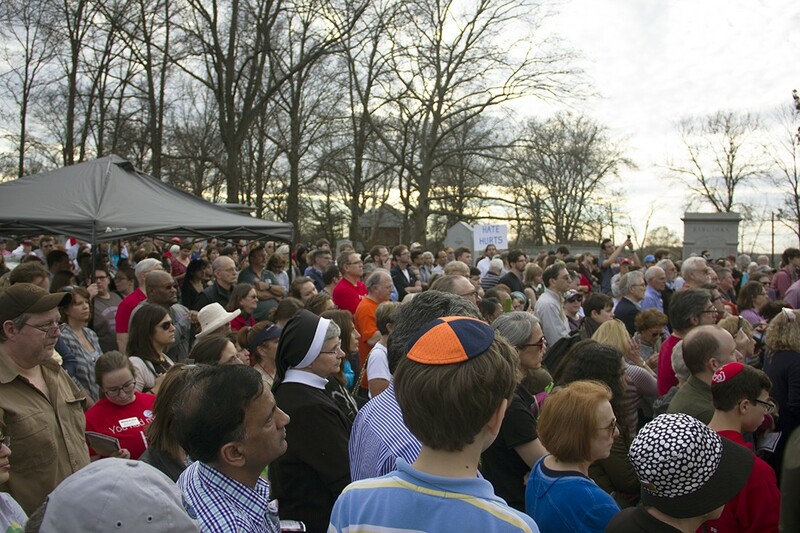 An interfaith crowd gathered for a vigil at the conclusion of the day's cleanup efforts. Jody Feldman, who has several relatives buried in the cemetery, was not impressed with Trump or Pence's visit. "I just don’t feel it’s terribly sincere," she said. She considers Pence a "deer in the headlights." 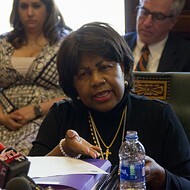 Although the graves of Feldman's departed relatives were undamaged, she felt compelled to come out and help, "given this political climate," she explained. Beyond the political optics, however, was an remarkable moment of cooperation that spanned religion, race and geography. Wednesday's cleanup effort was undertaken by hundreds of volunteers and supported with $91,000 raised in just days by Muslim Americans. Amid the tombstones, Catholic school students mingled with Jewish fraternity brothers and rabbis worked alongside Syrian refugees. Indeed, as with much of Jewish history, a calamity foreshadowed a greater moral victory, a celebration of commonality driven by selflessness. Here was a moment of good wrested from the shadow of the valley of death. It's fitting, then, that the name above the cemetery reads Chesed Shel Emeth — translated to English, the words mean: "The act of true kindness."